There are 3 other images of this object. See our image rights statement. See more objects with the tag container, personal, luxury, concentric, tapered, rippled. See more objects with the color brown tan firebrick rosybrown grey or see all the colors for this object. This is a Perfume bottle. It was produced by Lucien Lelong. It is dated 1950–65 and we acquired it in 1991. 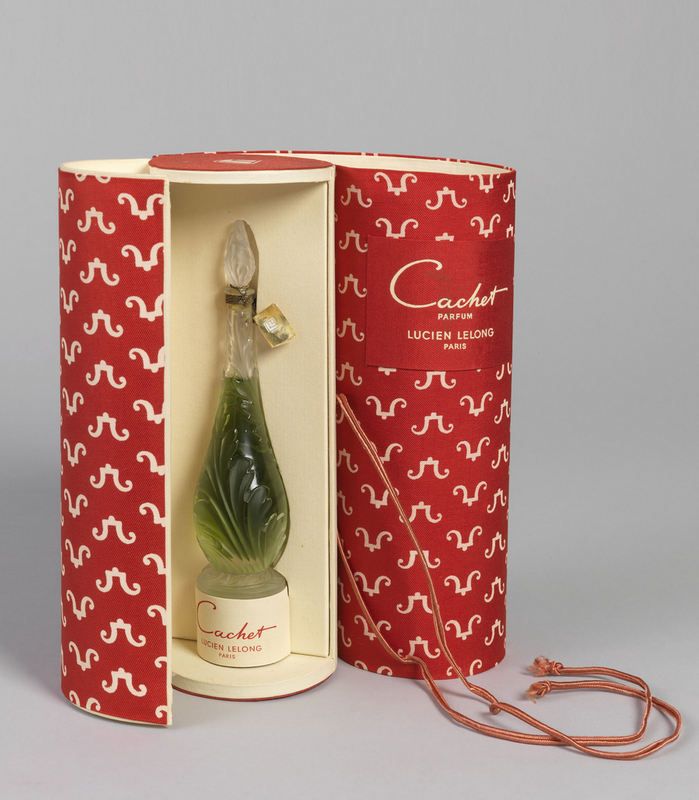 Its medium is mold-blown glass with applied metalic cord; gold foil on paper (label); cardboard with applied woven and printed textile, silk cord (packaging). It is a part of the Product Design and Decorative Arts department. Lelong, a well-known couture and ready-to-wear fashion designer in Paris in the World War I era, established Parfums Lelong in 1926. The company produced at least seventeen different fragrances, including “Cachet,” which launched in 1948. It was a green chypre perfume, meaning it had a mossy finish, suggested by the liquid’s green color and the molded acanthus leaf decoration of the glass bottle. This object was donated by Monique Fink. It is credited Gift of Monique Fink in memory of Peter Fink.